This Officer truly exemplifies what it is to be a good officer, he regularly communicates with his personnel developing a plan for each of them to achieve their goals and receive feedback on ways the better the department. Here’s a man that while serving a tour in Afghanistan checked on his personnel and the department weekly. After returning home he jumped right back into the role of Captain without hesitation. He never puts himself first and always has what’s best for his personnel in mind. He is a true leader that always leads from the front and is first in and last out every time! He is truly respected by his peers and subordinates. When I sit and think about what makes a good officer this individual comes to mind every time. He is active in his community coaching football, master of his lodge, and is attending college, while doing all this he still maintains a tight ship at the station and all the work gets done. Finally I believe that Captain Grant deserves and has earned this nomination for fire officer of the year. We are pleased to present the 2015 Officer of the Year Award to Captain Jamie Grant. 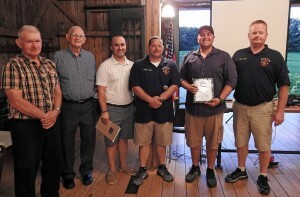 Throughout the last year, this Firefighter has been called upon to carry out numerous duties. He is always willing to step-up and help out in any situation. Whether it is performing maintenance on equipment and apparatus or helping to finish building projects, He is always one of the first to volunteer his services. 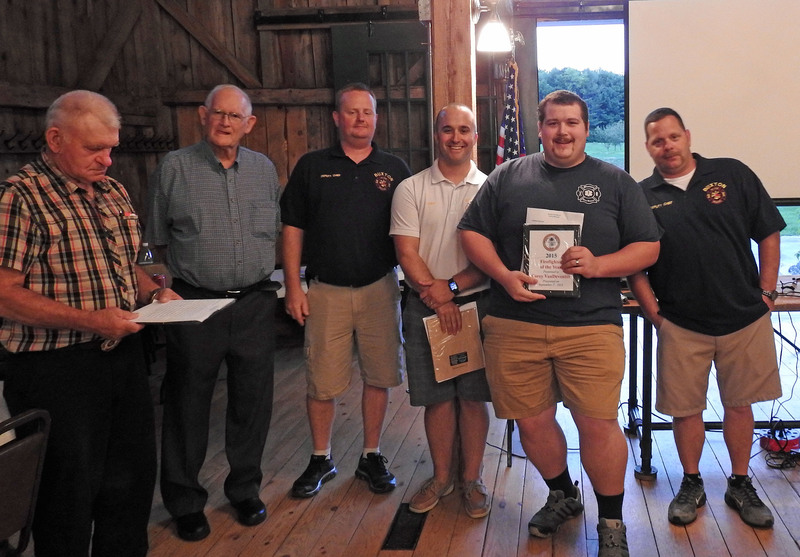 He has an eagerness to continually improve his knowledge in the fire service and share that knowledge with the younger members of the department. It is with great pleasure that we present the 2015 Firefighter of the Year Award to Corey VanDeventer. This member has been a dedicated member this year. He works hard and does what he’s asked. He always seems to be around when he is needed most. He is courteous to drivers and is safety conscious. 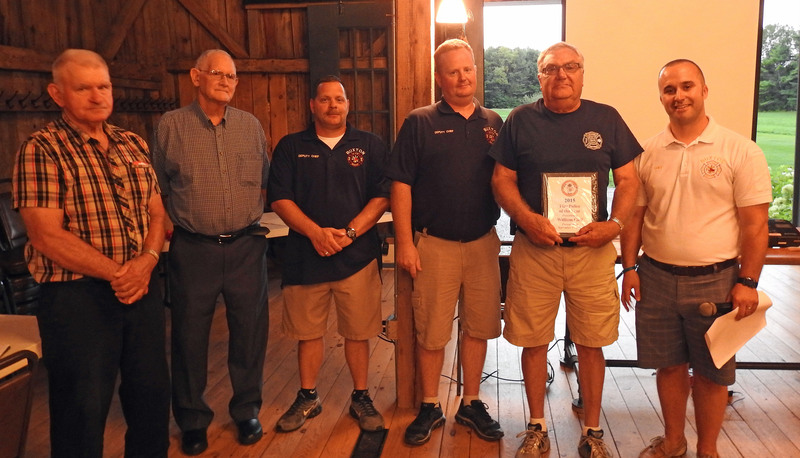 It is our pleasure to present the 2015 Fire Police Member of the Year Award to Bill Goff. This member responds to many of our calls – day and night and attend fire police training. He is the steady anchor in the Fire Police, quietly reminding members of the details involved with carrying out our responsibilities. He has even put together the history of the Fire Police in Buxton. He is one of our original members of the Fire Police unit and served as Lieutenant for many years. 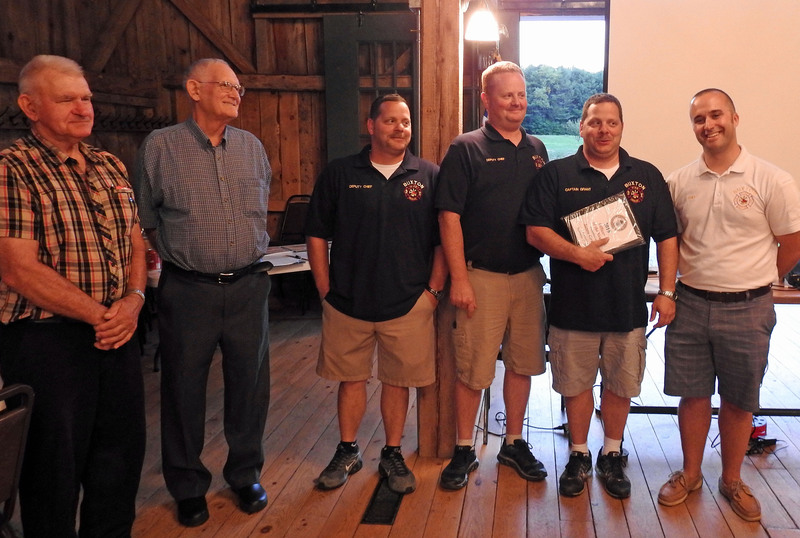 It is our pleasure to present the 2015 Fire Police Member of the Year Award to Carlton Berry. This EMS provider always seems to get the worst calls. And handles them with eases every time, and makes sure that her crew works for the good of the patient. I’ve learned a lot just from hearing her debrief some of her medical calls. She is very knowledgeable and respectively humble sharing her experience. 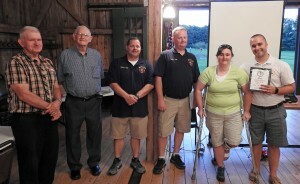 One of the most memorable calls she has had with Buxton Fire-Rescue, is a cardiac call with a patient who was experiencing a ST Elevation MI, where the patient arrested in the ambulance, and Lori and her crew saw the patient all the way through to the Cath Lab at MMC, and he walked out of the hospital. I saw the biggest smile on her face when the patient knocked on the door at Bar Mills Station to thank the department, and she just happened to be working that day, it really shows that she has her patients’ best interest at heart, and we are proud that she is a member of our team. It is our pleasure to present the 2015 EMS Provider of the Year Award to Lori Thompson. This individual has taken a lot of initiative to improve his skills and get hands patient treatment. He has a good attitude and is ready and willing to help with station duties. He is always motivated to train. Never complains about late night calls. He is very willing to help with anything when asked. He is not from Buxton, but he knows the roads very well because he took the time to learn them rather than rely on GPS. It is our pleasure to present the 2015 Student Live In of the Year Award to Jeff Roblee. This member is a hard worker. Always does what is asked and always asks if there is anything else he can do before he leaves after calls. He is eager to learn and strives to do learn more of what he can do as a junior. This individual was incredibly dedicated and was always there to lend a hand. It is our pleasure to present the 2015 Junior Member of the Year Award to Paul Yarumian.